Join us for the grand opening of a new Museum exhibition, Kids Collect! Visitors can draw from a collection still-life and enjoy playful spring-themed art-making activities. Guests can also enjoy food and drink from Palate. Be sure to check a live outdoor liquid-bronze pouring event facilitated by the Art Association of Jackson Hole and The Studio Project. Watch as young artists move forward in the process of creating bronze sculptures inspired by artwork from the Museum. Kids Collect celebrates the material culture of childhood through the unique collecting practices of kids, ages 16 and under. This exhibit features photographs of kids’ collections gleaned from their rich environment of natural and material objects. Discover the delicate feathers, interesting stones, race cars, brightly colored leaves, and many other objects that children gather and display as a way to understand the world and advertise their emerging identities. 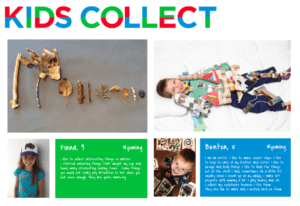 Adults will submit images of 10 objects from kids’ collections with quotes, from the kids, explaining their collecting strategies and impulses. The exhibition will be installed temporally by age so visitors can see the evolution of collecting strategies through time, culminating with the simultaneous exhibition of adult collectors in 20th Anniversary of Collectors Circle. Kids Collect is generously sponsored by Stephanie Brennan. Although the exhibit opens May 6, it is a “living” exhibit, and is currently welcoming new applications! Please see the links below if you are interested in entering. Kids Collect is on exhibit May 5, 2018 – August 19, 2018.